Friday is a magical day for everyone. Not only is it a day when the week finally comes to an end and we get to enjoy the weekend to relax and recuperate but it’s also the day when new movies hit the theatre to make the weekend plan even more interesting and entertaining. The only time I hated the use of Friday was in the song Friday by Rebecca Black other than that almost everything is magical about Friday. The evening drive back home with a relaxed mind, the food and the late night ahead without the worry of waking up for the next day. This app is available to movie lovers 24/7 as it gives them details about all their favourite movies running in theatres near you. Now get all the information you need about a movie to plan your outing accordingly. You can now know about the ratings on IMDB and Flixter, inside scoops about actors and the movie and everything you ever needed to know. You can rate a movie, write a review on it and spread the word around for others to find out about it. Never miss a good movie thanks to this app and keep pace with all the latest releases! BookMyShow is your go to app to satisfy the urge of the movie lover in you. You can now find out all the details about movies running in cinemas near you be it big cinemas like PVR Cinemas, Big Cinemas or even Cine Max or be it smaller theatres like Prithvi Theatre or Jagriti Theatre. You can book tickets through this app and read reviews and find out reviews about the movies you wish to watch to be able to make a better informed choice. 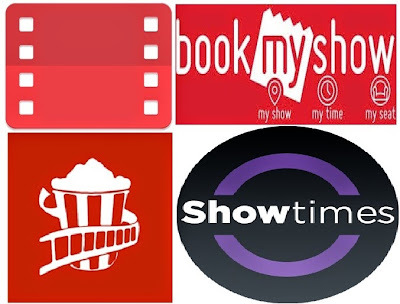 You can use BookMyShow Coupons to get great Cashback and discounts on your next movie outing exclusively given by CashKaro.com. IMDB is considered the go to website for any review and feedback be it for movies or TV shows. It brings together a collection of thousands of movies, TV shows and information about the making of movies as well the celebrities associated with it. Now read about the movie, watch trailers, photos, goofs, behind the scene scoops and much more thanks to this exciting app. You can read reviews both from critics as well as movie viewers and search for famous movie quotes, try your hand at the movie trivia and get inside gossip on the movie stars. This truly is an app for every movie and TV buff who cannot go a day without his entertainment. Google Play is an app that is pre-installed on almost all android phones. If you don’t have it you can download it to avail various benefits. You get to watch your favourite movies instantly on your android which you can download, to stream it without internet connection as well. If you do not want to purchase it you can rent it as well. You can get great deals on Google Nexus to enjoy this app using Amazon.in Coupons and get great discounts with cash back! Who said you can only enjoy a good movie in a theatre? True the experience of a theatre is unmatched but at times one doesn’t mind watching a movie without having to go out. At Cinematix you can do just this and stream movies, shows, documentaries and you get to choose from Classic Movies to Sports to Cooking. This app truly helpful to help you catch up incase you miss an episode of your show and you can now get entertainment on the go! Movies are a great way to pass time. They take away the tension and stress and help us forget our worries and tensions. Through these apps you can make your movie going experience even more fulfilling! Nice article, but nothing is better then Bookmyshow movie offers. Bookmyshow provides heavy discount on movie tickets.